NOTE: Connectors vary depending on camera model. Canon 400D/XTi, 450D/XSi, 500D/T1i, 600D/T3i, 1000D/XS, 1100D/T3, 60D, 70D. The CN3 shutter cable is no longer available. Nikon D4, D3, D3s, D3X, D2X, D2Xs, D2Hs, D2H, D200, D300, D300s, D700, D800/D800e. Nikon D90, D3100, D5000, D5100, D7000, D7100. PROMOTE SYSTEMS are regularly updating the range and models of cameras which are compatible with the Promote Control - you can CHECK HERE to see the latest cable compatibility list on the manufacturers website. 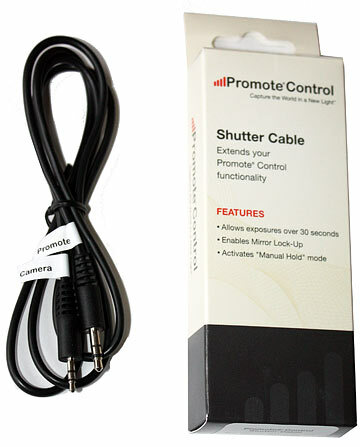 Promote control shutter cables CN2, N10, N90. 100D/SL1, 400D/XTi, 450D/XSi, 500D/T1i, 550D/T2i, 600D/T3i, 650D/T4i, 700D/T5i, 750D/T6i, 760D/T6s, 1000D/XS, 1100D/T3, 60D, 70D. Nikon D90 D600 D3100 D3200* D5000* D5100* D5200* D7000 D7100*. The SY3 cable is compatible with Sony Alpha cameras that also have a PC Flash socket or a standard flash hot shoe. Examples of supported Sony Alpha cameras are: SLT-A99 SLT-A77 DSLR-A900 DSLR-A850 Other Sony Alpha cameras may also be compatible if they have a round PC flash sync socket, or a standard hot shoe. The SY3 cable requires a separately available Promote Control HDR bracketing controller unit. * Cameras marked with (*) require additional USB OTG adapter cable due to non-compatible USB ports. NOTE: When ordering - please ensure your camera model is listed for compatibility above, do not presume unlisted models will be suitable.